Could it be worth seeing if the iPhone prints anything useful to the console? That might require a jailbroken device which would require a reboot. Or maybe it would work with XCode from a Mac. I don't know. > At this point, I am keeping the phone on charge in here in the broken state as long as possible, and have set up firewall access for Ubiquti engineers to have full access the APs and the controller and see what they can find. I hope they find more clues to the problem, but I appreciate it is tricky with some issues like this. Are the APs themselves on static IPs? Static in that they don't change, but assigned using DHCP. What is the DHCP lease time for the AP IP addresses? Could it be that when the APs attempt to renew their IP address it somehow barfs the control connection (CAPWAP?) to the controller, but doesn't drop the session to the client? I'll admit that I have no experience of the Unifi APS, so it is just guesswork from experience with enterprise WiFi systems. Do you get this problem if *everything* (AP, switches, clients) is static configured (ie NO DHCP at all)? They are 2 hour lease, 1 hour renewal, but I seriously doubt it. I'll see if Ubiquiti think that is worth a try. If this was happening you'd see it in the Events/Alerts section of the controller. The UAP would show as having disconnected/connected - sometimes you just see the " Connected" message but when the heartbeat from a UAP goes AWOL then you'll see it in controller logs. Also its important to note that the Unifi kit doesn't REQUIRE a controller to be present to function as simple WAPs. Once provisioned they'll generally work forever although roaming will not be as seamless (unless its Gen1 kit with ZHO, bizarrely that just works regardless) & obviously you lose the site-wide management ability. Default settings. All the IPs are sticky, so even if off line for days it will get same IP when it comes back, so no real need to change defaults. DHCP server is in PI space/datacentre then? If not then hours seem a bit short for a home DHCP daemon. Something goes wrong (power cut/whatever) & you're not home but wife is & APs lose local lan connectivity? I just pool the infrastructure seperately with different lease times. Sorry - not sure of the case you are covering, the DHCP server is the gateway router (albeit a couple of miles away). It is common in domestic set-up for DHCP server to be the gateway router. If that is AWOL for any reason, then access to APs is not really an issue! Even so the APs having an IP, or not, has no real impact on their function, just management. (Marginally) off topic - I hadn't realised that having a controller present impacted roaming around a set of Unifi APs. I only ever fire up the controller here just to check all is well and to do upgrades. So does the controller notice when a client is moving towards another AP and trigger the current one to actively reject the client somehow? I don't think making a config change will help find this as any config change results in reprovisioning all the APs. That in turn causes them to be briefly unavailable, hence causing clients to reconnect. Yeh, I did not realise it would do that as I did not touch that SSID, but now I know. There is a way to list the SSIDs and signal strength the iPhone ca see, which I did not think to check, sorry. Will next time. But yes, it is normally full signal strength and was 2.2m from the AP which is in the middle of ceiling. There is a slight hole in the coverage on most UAPs when mounted horizontally - to the right of the "U" on the front IIRC - but at 2.2m it'll make bugger all difference. Sorry if you've said all this before but the iphone is connecting on 5GHz and forcing it to connect at 2.4GHz makes no odds? Looks like the HD is the one to get for max coverage, Lite for multiple APs so they don't overlap too much. Well at 5GHz anyway. This SSID is only on 5GHz, but I am pretty sure testing long ago showed it was no different on 2.4GHz. HD looks nice, may do some time if we ever crack this issue. 4x4 MU-MIMO hence the good coverage. If you have access to an apple developer account you can install the wifi debugging profile (it generates logs and extra console logging) and/or perform on-device tcpdump/wireshark. You don't need a rooted phone for any of that. 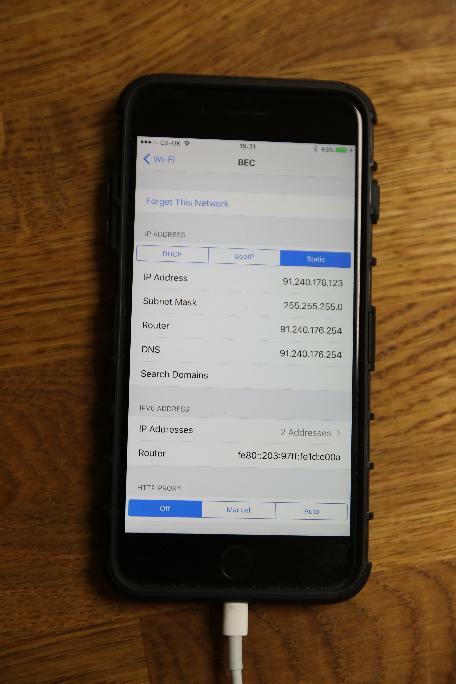 Since the AP says the phone isn't connected and the phone appears to not be transmitting any packets (it should at least be sending DHCP requests), it stands to reason that the phone's wifi firmware probably also thinks it isn't connected. My money is on the OS getting confused and thinking the wifi is associated when it isn't. The OS would be generating packets to be transmitted, but since the wifi isn't actually associated the firmware would probably just drop them. Can you take Pcap on quiet network segment when this happens? And maybe run arp-scan from wired segment and reconcile the Macs & IPs? I am wondering if the phone has switched to a new Mac due to its crazy privacy feature (anti-Mac tracking). Or is that only used when scanning for networks (802.11 Probe Request broadcasts)? Maybe worth arp pinging its normal Mac too. 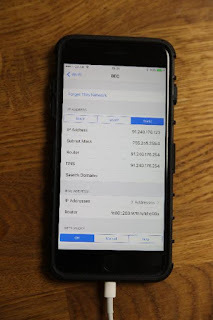 By the way... if the phone's network stack is still alive , then I'd expect to see a bunch of Probe Request frames when you press the Home button, if you watch in monitor mode from a laptop sniffing the air promiscuously. But it might not send the Src Mac that you normally see. "Ubiquiti think that any packet from the phone which thinks it is associated should cause a de-auth from the AP which should cause the phone to re-connect."